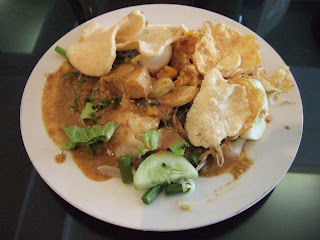 My favourite dish in Bali is gado-gado, a vegetable salad dressed in specially prepared peanut sauce. 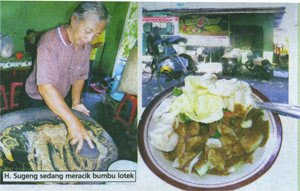 For lunch, I usually go to a warung (snack) and have gado-gado with tempe, tofu and lontong! Preparation of gado-gado is mainly the preparation of the peanut sauce, using cobek batu (Indonesian style stone pestle). The pestle makes the peanuts not to become too soft and produce a certain kind of flavor which cannot be achieved by using blender or peanut butter. Using a pestle is not just crunching the peanuts but also mixes them with all other ingredients. To do pestling is not to pound but to grind and mix all ingredients together in circular hand movement with enough pressure to crush all ingredients. In Indonesia, this is called uleg or ulek, a technique used in making varieties of indonesian food. Lontong (compressed rice roll) or rice. All prepartion is done in the cobek batu. Pestle chilli pepper and garlic. Add terasi, salt, coconut sugar, and the cashew nuts and peanuts. Add water and tamarind water little by little while keep on pestling until you get a thick sauce (don't put tamarind water too much, just put it to taste). Add the vegetables (also add half egg, tofu, and tempe if you like). Mix it with the sauce. Serve with emping and lontong (or rice).